May you remember, gradually we updated catalogue&leaflet&file holder and souvenir, no doubt it's time to renew sample box, on the previous oversea exhibitions, a huge amount of customers stopped by for checking our sample box, they appreciate the nice appearance and the multifunctional characteristic. 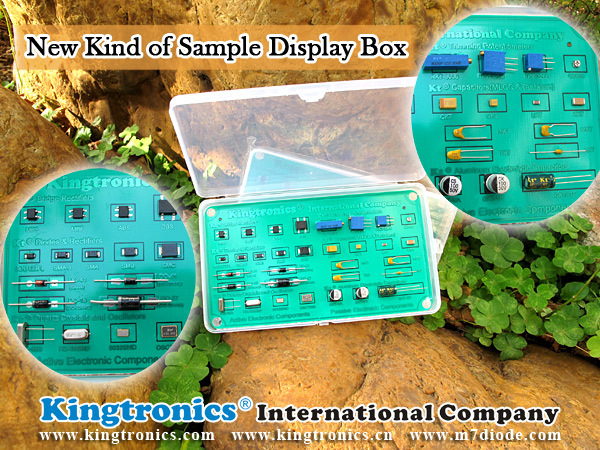 Now check what's charm on the latest sample box, obviously all of our popular product series are included inside, bridge, diode, crystal&oscillator, trimming potentiometer, multilayer ceramic capacitor, tantalum capacitor, aluminum electrolytic capacitor, interestingly it looks like a pcb, also customers can easily tell our production lines. Let us take advantage of these updated promotion materials( http://www.kingtronics.com/packing/Kingtronics-Promotion-Materials.html ) and win more market share together, please feel free to get them from our sales.